Colourful Neon balloons to add a little extra colour to your party! Fantastic for creating neon balloon displays or simply for a little fun! The perfect neon party decoration! 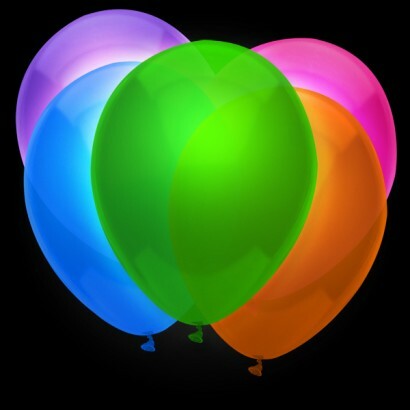 In a dark room with full UV not all balloons glow. Pink orange and green are best. We tried to blow these balloons up using helium and 17 out of 19 burst before they were inflated. Very disappointing. The ones that survived or were blown up by mouth did look wonderful under the UV light. As previous reviewers have found, the Purple balloon is completely ineffective and does not glow in the slightest. TGC seriously need to find a different supplier for the Purple balloons as that's 20% of everyone's order which is a complete waste of money! A reasonable proportion worked well and looked good, but as a previous reviewer mentioned, the blue and purple ones don't fluoresce at all which was a shame.